North Sumatra is a miniature of Indonesia where the beauty of cultures, customs, and tradition is showcasted, according to President Joko “Jokowi” Widodo. 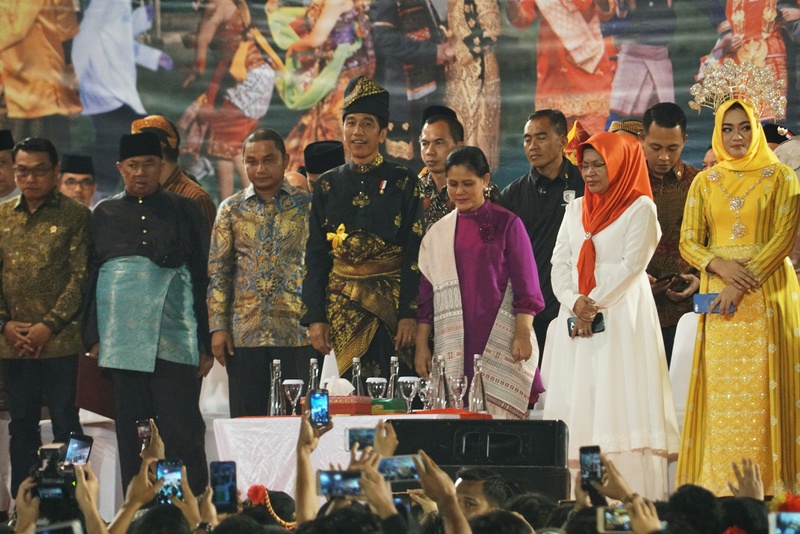 “There are various ethnic groups including Batak Karo, Batak Mandailing, Batak Pakpak, Batak Simalungun, Batak Toba, Malay, Nias, Chinese, and Indian, and also various religious beliefs including Islam, Protestantism, Catholicism, Hinduism, Buddhism, and Confucianism,” President Jokowi said when attending the North Sumatra’s Cross Ethnic Cultural Performance, at Telada Stadium, Medan, North Sumatra, Saturday (16/3). On that occasion, the President reminded all that Indonesia consists of 714 ethnics and more than 1,100 regional languages. For example, he added, there are several different versions for word ‘halo’ in North Sumatra, such as horas (Batak), mejuah-juah (Batak Karo), ya’ahowu (Nias), and jua-juah (Batak Pakpak). According to the President, North Sumatra does not allow a room for conflict and disharmony. Thus, he reminded people to not split up because of political choices be it for regent, mayor, governor, and presidential elections. “It will become a great loss for us, and for the nation. Please be wise,” President Jokowi reminded people. The Head of State went on to say that regional, legislative, and presidential elections are a ‘fiesta of democracy’ that held only once every 5 years. Thus, the President asked all to not sacrifice our long-standing unity, brotherhood, harmony, and synergy. “Let us maintain our brotherhood, unity, and harmony because these are the aspects that create synergy among us,” he said and reminded people attending the event that Indonesia is a big country, home for 269 million people spreading across the archipelago in 17,000 islands, 514 regencies and cities, and 34 provinces. On the other part of his remarks, President Jokowi invited all people to go to the polling stations (TPS) on 17 April 2019 to cast their votes in the election.